Are all guitars in the same price range created equally? As a beginner guitarist back in 1990, I would have thought so. I received my first guitar as a gift from my parents, and had I known then what I know now, I would have been able to save money for them while being more satisfied with the quality of the guitar as I became more skilled. Here is a simple list of critical factors to keep in mind before making this investment. We'll visit these in more detail throughout this article so that you are more comfortable when going to make that first purchase. After all, an informed and educated consumer makes for a wiser investment. Through this process, we will share real life experience: while guiding a friend away from making a poor investment in an overpriced guitar simply because it was a popular brand name with his first beginner acoustic guitar purchase. Along the way, see if you can highlight all of these critical factors, neatly summed up into 3 major areas in this true story. Although price is a major factor, there are vast differences in quality, sound, and craftsmanship in each price range. Whether purchasing a guitar for a beginner, an intermediate guitar, or a more professional model, all guitars in the same price range are not created equally. I had a good friend (Gary), who knew I was a decent and 'picky' guitar player, as well as a musician. He was an accomplished drummer, and decided he wanted to invest a decent sum for a new guitar. He understood the concept of buying a quality guitar to start with as he knew it would discourage him if he purchased a sub-standard guitar. I took him to the guitar shop of his choice as he had read about the guitar he thought he wanted and found they carried it at that location. He had based his decision off of the name brand (reputation) of the guitar company. When we arrived at the store, he went straight to the model to show me his pick. I sat down, looked at the construction, looked at the tuning keys, the bindings and the tone woods. I strummed it a few times and told him that it was a $150 guitar with a sticker price of over $1100. Although I had known this company to be very reputable, I could not believe the lack of quality in such a highly-priced guitar model. So, because I had studied guitar construction for over 3 years before buying my first professional guitar and had sampled hundreds to learn the subtle differences, I introduced him to another manufacturer in that same store. As he sat and compared the two, I pointed out the differences in quality which became more apparent to him as I 'picked' through both of them. I also played both for him so he could hear the differences in projection and tonal quality. In about 3 minutes, he purchased my recommendation and has been thrilled since. He arrived at the store ready to pay $1100 for a poorly constructed guitar, that should have sold for $150 or less and actually invested about $1250 for a far superior guitar. I also knew that the manufacturers of the superior guitar had gone through years of painstaking craftsmanship similar to the famous Stradivarius Violins because I had studied them and was confident in their production. While some guitars sell for $10,000 and more, one does not need to break the bank or even pay $1000 or more for a decent quality guitar. Some manufacturers are producing great quality entry level or beginner guitars in the $200 - $400 range that intermediate and professional 'strummers' would enjoy playing. As we sat there, combing through the guitars, it was clear that his first choice was made of an inferior tone wood with inferior craftsmanship. Although these days one can get a decent 'feel' for a guitar online while reading many reviews, that was not available then. Each tone-wood can give the guitar a slightly different tonal balance as different woods emphasize different vibration frequencies. The top of a standard steel string guitar is commonly made of either Sitka Spruce or Englemann Spruce. These are durable yet light woods that grow in cool climates, with annual rings that are very small, giving the wood a very tight, straight pattern and providing strength and tonal consistency (when it vibrates). Although there are many exotic woods used for the back and sides of a guitar, most guitars will depend on Rosewoods or Mahogany, or a combination of the two to give subtle differences in sound. While Rosewood sides and back can tend to give a little more low end and round out the bass sound of a guitar, it also balances the mid and treble ranges very well. Mahogany sides and backs often give off more projection in the mid range, making the guitar great for blending in with other instruments. Mahogany is also well balanced if the construction quality is decent. Many guitar sides and backs are also made of maple. While often lighter in color, maple guitars tend to project more sound in the mid to upper EQ range, making it a 'brighter' sound. Additionally, guitars come in different finishes or lacquers. If you prefer a guitar that is toned down a bit (a little more mellow), a satin (non-gloss) or flat finish will make quite a difference in tone and projection. A guitar with a glossy finish will project a bit more. Also, consider the body style or size of the guitar. There are several models and they vary by manufacturer including but not limited to: Jumbo, Dreadnought, Grand Concert, Parlor, Classical, etc. If you prefer a large, booming, and base slanted sound, you would prefer a Jumbo or Grand Concert Style. If you prefer a standard that excels in all ranges and has great projection, the Dreadnought is now an industry standard size first produced by C.F. Martin years ago. Now nearly every company carries a Dreadnought model as it is very standard. If you prefer a smaller guitar, perhaps for a smaller individual or would appreciate the more compact sound and feel, a parlor size guitar might be your choice. While in your search for the best guitar for beginners, don't get caught up on brand as my friend might have. At one point in my guitar career, I was set on purchasing a professional range guitar made by a certain company because I had heard them played and promoted by several bands in concert. Though I had never touched one, I knew it was what I wanted. Several months later, I had the opportunity to strum a few different models that were owned by friends and acquaintances. I later played a guitar from a completely different (Canadian) company and instantly knew it was what I wanted. I still own this guitar to this day and am glad I did not choose the previous option. Giving the guitar a final inspection is a great last measure. Look for flaws in the lacquer, visible flaws in the seams of the guitar (where the wood is glued together). Inspect the quality of the tuning keys and other equipment. If the tuning keys and other visual elements make you feel a bit uncomfortable about the quality, you are probably best to steer away from that particular model (not necessarily the brand as models within a brand can fluctuate significantly). Finally, when comparing guitars, it is also good to read many reviews and see why people raved about a certain guitar, or why they did not. Mass public opinion on a manufactured product such as a guitar can often be fairly insightful. If a quality flaw exists in such a product, it is bound to be revealed consistently across some reviews. Many people are purchasing guitars online, especially mass produced guitars for beginners because it is often more convenient and the buyer has access to more information online (good and bad). If you are ready to purchase a guitar online, use this guide and do your homework and make the decision when you are confident that you have done adequate research. Here's a quick summary checklist to help you on your first or next acoustic guitar purchase. •Look at the bindings and glue seams- do they look solid or sloppy? This article was written by Aaron Schulman, a musician since 1984 and an avid acoustic guitar player since 1990. Because of his disappointing experience with his first acoustic guitar, he studied guitar makers, construction and tone-woods for 3 years before purchasing his professional acoustic guitar. 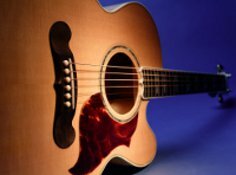 Before buying your first guitar, read his report on buying the best beginner acoustic guitar at strumviews.com. Aaron is happily married with 3 girls and owns an Ohio web design company. Beginner’s guide to the guitar! As a professional music teacher, and experienced Guitarist, Naomi thinks it’s an absolutely wonderful instrument to learn. It takes dedication and practice, but my word, there’s nothing more satisfying than creating music with your fingers! Hopefully her guide helps you decide if it’s the right instrument for you.